Spring Transactions library is useful for transaction management in your Spring-Hibernate application. A transaction is a single unit of work, in other words – a group of database interactions that should happen together. If any one of these ‘database interactions’ fail then the changes of the previous interactions in the set should be undone. Transactions are usually (depending on granularity) declared at the service layer of your application. Service layer is the logical place where your transaction should start and a typical service layer method would call 1 or more DAO layer methods. Important to remember while using @Transactional is to define the condition for rollback. It is a common to incorrectly assume that because you’ve used @Transactional, Spring will take care of rolling back the whole transaction if something fails. This is not true. Spring only rolls back the transaction if your method throws an unchecked transaction i.e. Runtime Exception. It is much better practice to use the rollbackFor attribute instead. The rollbackFor attribute tells Spring what other situation (in addition to a runtime exception) to rollback for. In the example below I specify that transaction should be rolled back if any exception is thrown using attribute rollbackFor=Exception.class. In addition to above, one way to ensure that DAO methods are always part of an existing transaction initiated at the service layer is to use propagation = Propagation.MANDATORY attribute in your DAO method. If all your transactions are initiated at the service layer it would be good idea of put this attribute on all your DAO methods. With this annotation in place, whenever a DAO method is called without the caller service starting a transaction, you would get an exception stating that no active transactions existed when method was invoked. If you’ve used Spring Security before you’ve probably used @Secured or @PreAuthorize annotations to enable method level security. These annotations are specifically useful for preventing your web applications being attacked by malicious users. Method level security makes sure that only authorized users can execute the specific method. However, the limitation with the above annotations is that rely on GrantedAuthorities of the in session user. In other words, you are limited to the just the roles of the user to control the access to a specific method. What about when you want to use another attribute, lets says a STATUS determined by an external service? Or perhaps you have there is a reasonable amount to logic involved before deciding a particular user has access to a specific controller level method of your Spring app? //Complex logic can be performed here. The AccessManager.hasAccess() method can be called in the @PreAuthorize annotation anywhere in your application. Only when AccessManager.hasAccess method returns true with the parameters specified in the annotation, the updateUser method would get executed. What is LDAP? LDAP stands for Lightweight Directory Access Protocol. It’s designed to query and interact with directory data. As most enterprises use Microsoft directory service provider called Active Directory or AD, LDAP is commonly used to ‘talk’ to an Active Directory. Developers tend to be confused about the difference between AD and LDAP. In short, AD is a database and LDAP is a protocol used to talk to an AD database. The Java JNDI API can also be used for LDAP programming. If you’ve used JNDI API you may realize that it requires a lot more boilerplate code for even for the most simple tasks. Using Spring LDAP template on the other hand is a much more efficient way of implementing all of your LDAP related functionality. After importing the above jars, you need to create the ldapTemplate bean in spring context file. For example, I declared my ldapTemplate in the context xml as below. url: the url property should be either the IP address or the URL of the Active Directory you’re using. Please make sure that you use port 689 in production. Port 689 ensures communication through LDAPS protocol which is more secure than standard LDAP. You will need to import the certificate of the Active Directory you are connecting to into your java trust store. After you have correctly set the above properties, you will need to inject the ldapTemplate bean in your java class. In the example below I use the Spring @Autowired annotation to inject the bean into my controller class. Once, you’ve injected the bean, you can finally write the java code to enable LDAP Authentication. In the snippet below I write a simple method called authenticate which authenticates a user if the correct username and password combination is supplied. This is obviously not going to be the case in real life. So we need some additional information to be returned by this method. It would nice if the method could return information related to failed password count and locked out time. This would help you understand why a user is not authenticated. We’ll use the user search function provided by spring-ldap to return the user’s attributes. We’ll add the below code to the function we just created above. The above code snippet shows how we can use the sAMAccountName attribute to search for the user. The sAMAccountName usually corresponds to the username given to the user. There is a slight chance that this might not be the case for the active directory you’re using so please just verify that sAMAccountName does actually correspond to the username used by users for logging in. Another thing to note here is that lockoutTime returns a null value if the account has never been locked before and 0 if it’s been locked before but is not locked currently. Obviously, the method can modified to return the values of other attributes if needed. According to AWS documentation, creating the right security group configuration should be sufficient to allow for desired communication between your AWS EC2 instance and public internet. However, that’s not quite the case when you provision a Microsoft Windows 2012 VM as an EC2 instance. I provisioned a windows 2012 EC2 instance and opened the following ports on it (Security Group Configuration Image below). Port 8080 for TCP communication over port 8080. This was primarily because my Java app was a Liferay web app which comes bundled together with Tomcat 8 server and deploys to port 8080 by default. You can modify server.xml to change this port. After configuring the security group settings above and provisioning the EC2 instance, I needed to be able to access a very basic web app deployed on a Tomcat 8 server from the public internet. Navigating to http://localhost:8080 worked fine from within the Windows VM, however, if I accessed http://<vm-public- ip-address>:8080 from my web browser on the public internet I was not able to navigate to the app. Turns out the only way to fix this is to modify the windows firewall rules on the VM in addition to the security group configurations above. Click on Advanced Settings. This should open Windows Firewall with Advanced Security windows. Click on Inbound Rules. This should display all the inbound rules for the firewall on the server. 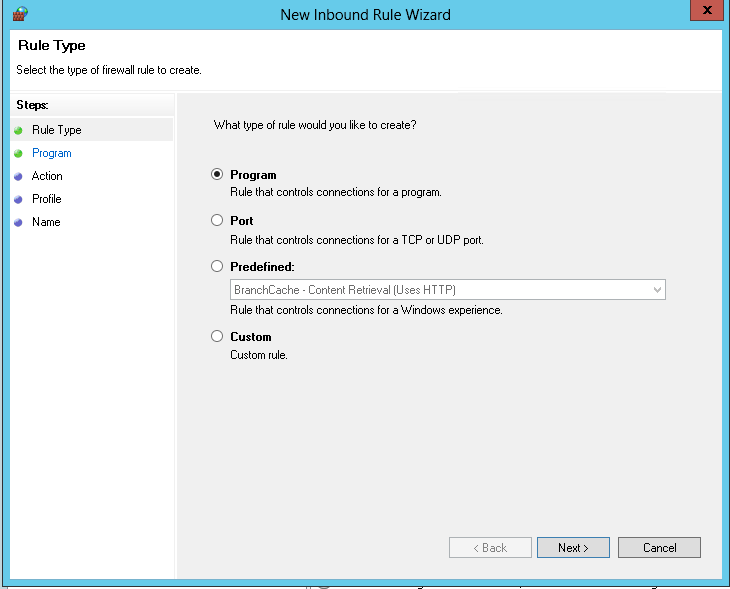 Click on New Rule… This should open ‘New Inbound Rule Wizard’. Select ‘Port’ radio button -> Click Next -> Enter 8080, 80, 443 in ‘Specific local ports’ -> Click Next -> Select ‘allow the connection’ -> Click Next -> Click Next -> Enter “Custom Inbound rules” under Name -> Click Finish. If you try to access your app web app from the public network, you should be able to access it. SSLv3 is vulnerable to POODLE attacks. If you’re running your web application on JBoss AS 7.1, you need to disable SSLv3 in order to protect your web application from POODLE attacks. JBoss AS 7.1 does support more recent versions of TLS but it is still subject to a downgrade attack i.e. the attacker tricks the browser into connecting with SSL v3. Try to access the web page of your app deployed on JBoss AS 7.1 server. If you can successfully navigate to the page that means SSL v3 is enabled. If you cannot navigate to the page that means SSL v3 is disbaled. This means your web application is already protected against POODLE and you don’t need to do anything. 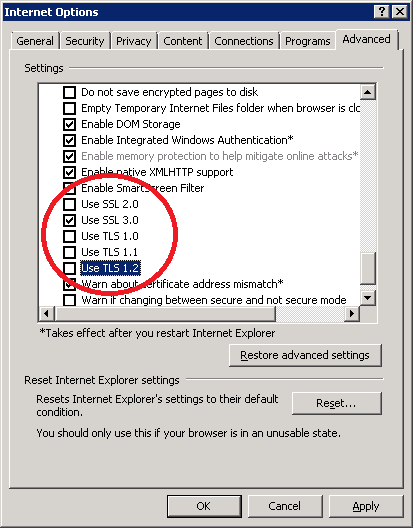 Now turn TLS back on, try to access the web page again, you should be able to access the site. To disable SSLv3 in JBoss you need to make sure SSLv3 is not listed in the list of protocols in standalone.xml on your JBoss server. It is located in the configuration folder of your JBoss App server directory. Change the value of protocols attribute to TLSv1, TLSv1.1, TLSv1,2. Notice below in the original config – protocol list only contains TLSv1 and protocol is changed to protocols in the modified xml. Code snippet from original configuration file. Please note that if you’re running Java 6(JDK or JRE), you can only run TLS v1.0. TLSv1.1 and TLSv1.2 require Java 7 (minimum) to be running on your server. Liferay LDAP Export to Active Directory disabled user bug. Liferay 6.1 LDAP tool has a bug where the Liferay user is exported into Active Directory but is disabled by default. After much deliberation I found a workaround where we can write a hook to export users instead of using the out of the box tool. The hook uses a Model Listener on the User Model to look for changes to the user object i.e. the custom code is triggered when anything about the User object changes. The custom code uses the Java JNDI interface to create and or update users in Active Directory. log.info("Attempting to create user: Screen Name: "
+ user.getScreenName() + " :First Name: "
+ user.getFirstName() + " : LastName: "
+ user.getLastName() + " Email:"
+ user.getEmailAddress()+ " OpenID: "
+ user.getOpenId()+ " JobTitle: "
A common requirement for enterprises is to have the ability for the users in their Active Directory to be able to login into Liferay Portal(s) with Active Directory credentials. This can be achieved in Liferay by using the Liferay LDAP tool that comes bundled together with Liferay Community Edition. This tool works well when you just want to allow AD users to login with AD credentials into Liferay. There are a number issues with exporting user from Liferay to AD but lets just focus on import for now. Liferary integrates with AD through importing the users. This means that if user wants to be able to login into the portal his record has to be present in the Liferay User database. So whenever you enter your credentials into the login screen of a Lifray Portal integrated with AD, the LDAP tool would always check your credentials entered againsts the AD and if there is a match you will be logged in. Lets have a look at the configurations required to enable this. Login into Liferay as an admin user. Go to Control Panel -> Portal Settings -> Authentication -> LDAP. Click Add, this will open ‘ADD LDAP Server’ page. Otherwise, port 389 for insecure LDAP connections. If you click ‘Test LDAP Connection’ now, you should see a pop up suggesting that Liferay has successfully connected to the LDAP server. If the message suggests failure to connect, then please make sure your configurations are correct before moving forward. Authentication Search filter: This is the filter that Liferay LDAP would use to search for a user in AD. So if you set it to (mail=@email_address@) then liferay would search would search for the user with the supplied email address in AD. You can set multiple filters on this, for example (&(objectCategory=user)(mail=@email_address@)) would also check that the objectCategory is user in addition to matching the email address. Import Search filter: This filter is used by Liferay LDAP tool for mass import of users. I would recommend to not use mass import if you dont have to and let import only happen at user login. For example, if you set this filter to (objectCategory=user), the LDAP tool will import all users that have objectCategory of user. Screen Name: cn (Screen Name is usually mapped to the cn attribute in AD, you could map it to sAMAccountName as well depending upon your requirements). If you click ‘Test LDAP Users’ you should see a list of users in a pop up. If you dont see a pop up or there are no users in the pop up, this means that the configurations you entered are not correct. Please go back and check your configurations. Please make sure that the export section is blank as we are not exporting users from Liferay to AD. All your configurations should now be saved in PortalPreferences tables in Liferay database. Go back to the LDAP tab now and make sure you have checked Enabled and Required checkboxes and save your changes. If you log out and log in with a user that exists in AD you should be able to login if you’ve enterd the correct credentials.